Hemel Town captain Jordan Parkes believes his side can get back to winning ways against table topping Bromley on Saturday after recording a hard fought 2-1 win over Dacorum neighbours Berkhamsted in the Herts Senior Cup last night. Parkes was again on the scoresheet with a trademark free-kick, and he says the victory will help to erase memories of Hemel’s disappointing 3-0 defeat to Bath City on Saturday. 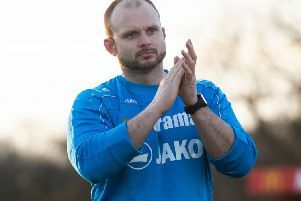 Speaking after the game, Parkes said: “It was a good win, obviously Berko were tough and up for it so it was tough for us to make the breakthrough to start with. Parkes has been on hot goalscoring form again this season, and last-night’s free-kick just added to a portfolio of stunning strikes from the Tudors skipper. “It’s all about practice really,” he said. “I think that’s my ninth free-kick of the season. I feel confident going up to every free-kick and feel as though I’m going to score. “I’m always practicing in training and this season I feel confident going up to every free-kick and feel as though I’m going to score. Parkes is now looking forward to Saturday’s visit of Conference South table toppers Bromley, and the midfielder says Hemel will be ready for the challenge, despite Saturday’s lacklustre display. “Bath was a bad performance from everyone really – one of those bad days at the office where we never got going,” he said. “Credit to Bath, they kept going, but I think 3-0 was probably a bit of a flattering scoreline for them. It was poor from us. “I don’t think we were going to put out as strong a team as we did tonight, but I think after the loss at the weekend it’s good to get back to winning ways. “We tried something different out tonight, with a change of formation and a few different faces coming in, so hopefully we will get back on it on Saturday with a win under our belts. “We’ve done well against the top sides this season, apart from the one blip against Boreham Wood, so we will be going into the game full of confidence after tonight’s win. “We beat Bromley down at their place so we know what they are about. We know it is going to be a tough game but as long as we perform to the standards that we know we can, we should be OK.